Show your Disability Pride and get FREE YO! swag! 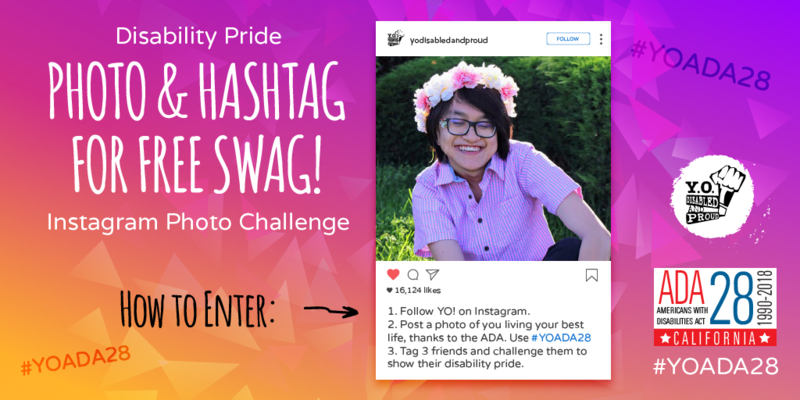 Show your #DisabilityPride photos on *Instagram* and win FREE swag! This July, CFILC and all of its programs are celebrating the 28th Anniversary of the Americans with Disabilities Act (ADA) by giving away YO! swag– Disability Pride posters, buttons, and tees! 2. Between July 13-26, post a photo of you living your best life, thanks to the ADA. Use #YOADA28. YO! Will contact folks showing the most Disability Pride in their photos to send prizes. Please note: we are only able to send prizes to participants within the continental U.S. The deadline to post photos is Thursday, July 26, 2018 11:59 p.m. PST.